Samsung Electronics introduced its new near field communication (NFC) chip, the S3FWRN5, which features high radio frequency (RF) performance and small package size. The S3FWRN5’s RF performance doubles the range in both reader and card emulation modes, when compared to that of its predecessor, the S3FNRN3. With a mere package size of 2.4mm x 2.4mm, the industry’s smallest for stand-alone NFC IC’s, the new NFC IC offers mobile device designers a more flexible and efficient printed circuit board (PCB) layout. For smartphone manufacturers, the chip’s pin-to-pin compatibility also allows convenient application as a stand-alone NFC IC or NFC System-in-Package (SiP) with embedded secure element (eSE). As the industry’s only NFC IC built using a 45nm e-Flash process, the S3FWRN5 allows easy and secure firmware updates without having to redesign the architecture. The e-Flash portion can be safely modified through firmware updates, when new features need to be added to the chip. This enables mobile device makers to reduce the development time in comparison to solutions based on read-only memory (ROM). The S3FWRN5 is also equipped with Samsung’s low power sensing (LPS) technology, a newly optimized algorithm to sense the signals at the lowest possible level of power consumption. The technology minimizes the NFC IC’s energy consumption, when it sends out continuous signals to recognize other NFC-enabled devices or NFC tags. By adopting LPS technology, the chip’s power requirements are reduced by approximately 25 percent when compared to Samsung’s most recent NFC product. Based on its compelling RF performance, this new NFC solution has obtained several NFC certifications across the world, which were awarded by reputable organizations, such as Europay, MasterCard and Visa (EMV), China UnionPay, China Mobile Communication Corporation (CMCC) and the NFC Forum, and is universally compatible with contactless NFC readers and NFC tags globally. Samsung started mass producing the 45nm e-Flash NFC IC during the second half of 2014. 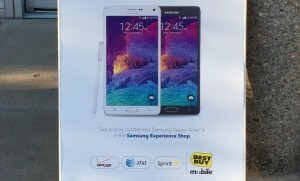 The NFC IC is featured in the latest Samsung flagship smartphone, the Galaxy Note 4. Samsung will continue to expand the application of this NFC solution in the global market.